TWO: Once the mixture is smooth, place the shea butter into a heat safe container and melt in the microwave using 30 second bursts. Once completely melted, add to the citric acid and baking soda mixture. Use your hands to fully incorporate the butter into the dry ingredients. THREE: Add the Lavender 40/42 Essential Oil, and use your hands or a spatula to fully incorporate the essential oil. FOUR: Split the mixture evenly into three containers, it’s okay to eyeball it. 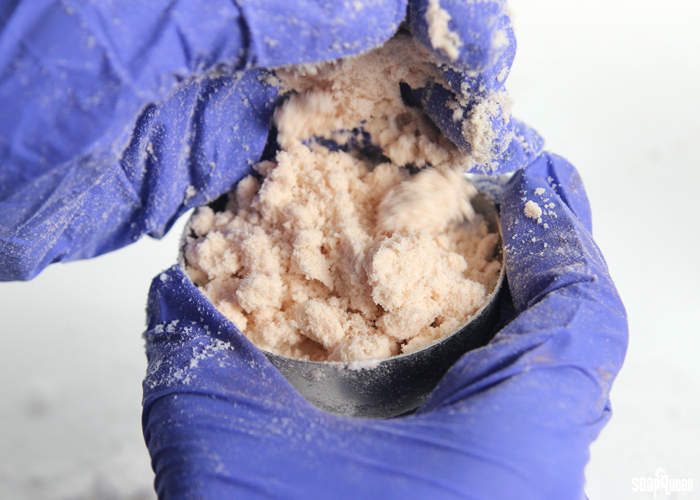 To one container, add the pink Brazilian clay and use your hands or spatula to fully incorporate. 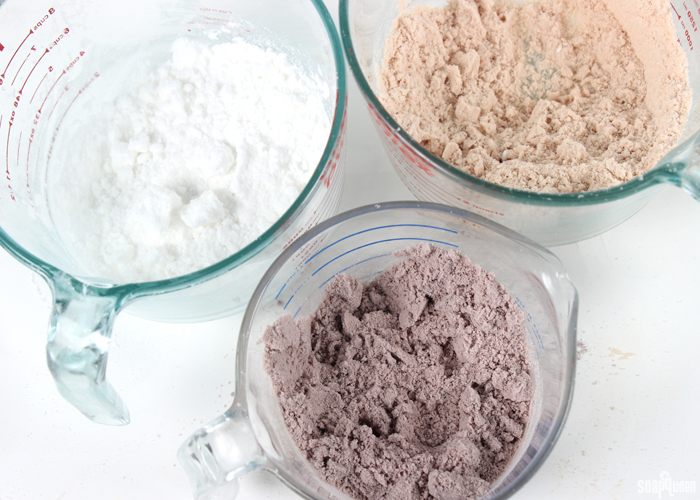 To another container, add the purple Brazilian Clay and use your hands or spatula to fully mix in. 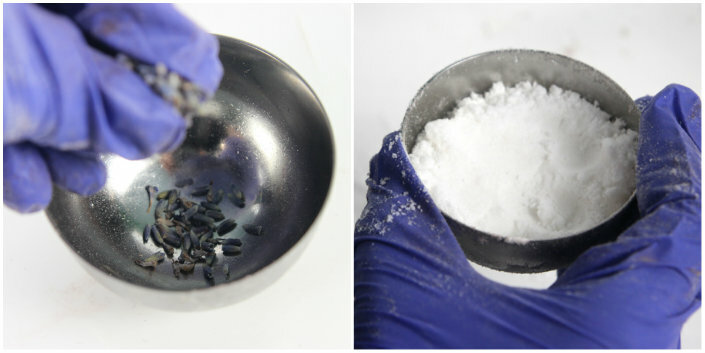 FIVE: Depending on the moisture level of the current mixture, spritz the bath bombs with witch hazel. It usually takes between 7-10 spritzes, and the mixture should be wet enough so when you squeeze the powder in your palm, it will stick together. If you don’t have witch hazel, adding extra shea butter will help the dry ingredients stick. SIX: Once all the colors have reached a mold-able consistency, place a small amount of lavender buds into a half of the bath bomb mold. Just a pinch does the trick! Then place some white bath bomb mixture into the mold, covering the lavender buds. Fill the bath bomb mold about half way full with the white mixture. SEVEN: Cover the white layer with the pink bath bomb mixture. Once full, set aside that half of the bath bomb mold. EIGHT: Fill the other half of the bath bomb mold half way with purple bath bomb mixture and pack down. Fill the remainder of the mold with pink bath bomb mixture. Slightly overfill this half with the pink mixture, and squeeze the two halves of the mold together firmly. NINE: Very gently, pull one half of the mold away. Slightly twisting while pulling away can make this process smoother. It can be a little tricky to get the fizzies to stick together…but practice makes perfect! If they do not stick together the first time, you can try again a few times if they begin to crumble. TEN: Once one half of the mold is removed, you can leave the bomb in the mold for an hour or so to harden and then gently tip it over and remove the other half of the mold. ELEVEN: Allow to harden for at least 24 hours. Then package in in cellophane or plastic wrap to protect them against excess moisture and enjoy! What scent do you find particularly calming and relaxing? One of my favorites is the Relaxing Fragrance Oil, which is a blend of lavender, vanilla and musk. Once the mixture is smooth, place the shea butter into a heat safe container and melt in the microwave using 30 second bursts. Once completely melted, add to the citric acid and baking soda mixture. Use your hands to fully incorporate the oils into the dry ingredients. Add the lavender 40/42 essential oil, and use your hands or a spatula to fully in the essential oil. Split the mixture evenly into three containers, it’s okay to eyeball it. To one container, add the pink Brazilian clay and use your hands or spatula to fully incorporate. 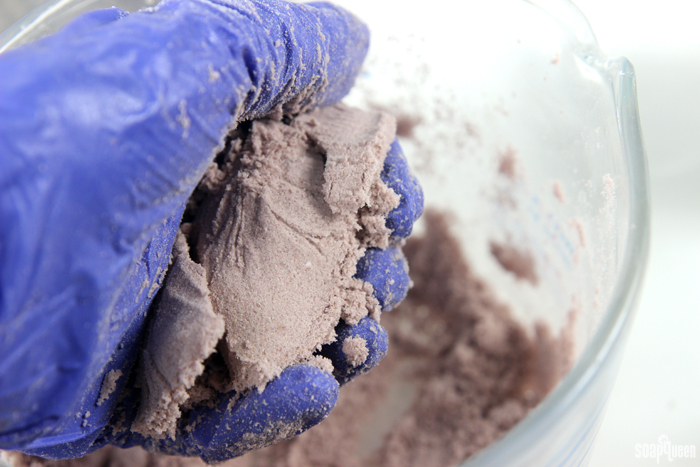 To another container, add the purple Brazilian Clay and use your hands or spatula to fully mix in. 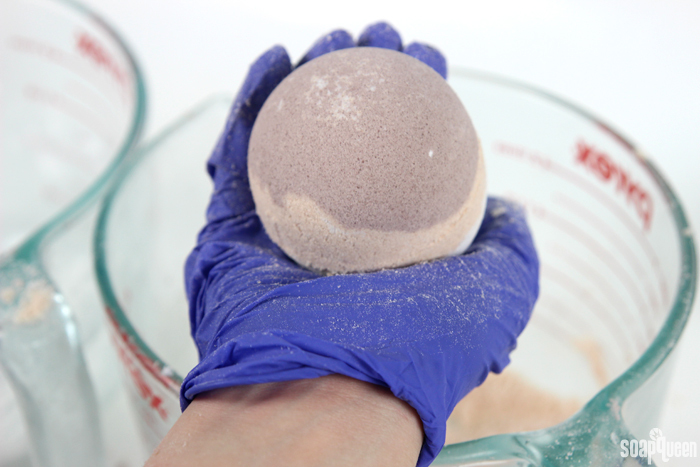 Depending on the moisture level of the current mixture, spritz the bath bombs with witch hazel. It usually takes between 7-10 spritzes, and the mixture should be wet enough so when you squeeze the powder in your palm, it will stick together. If you don’t have witch hazel, adding extra shea butter will help the dry ingredients stick. 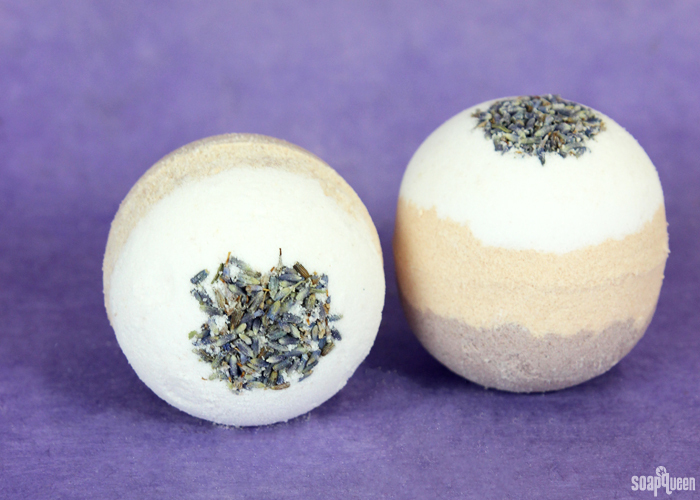 Once all the colors have reached a mold-able consistency, place a small amount of lavender buds into a half of the bath bomb mold. Just a pinch does the trick! Then place some white bath bomb mixture into the mold, covering the lavender buds. Fill the bath bomb mold about half way full with the white mixture. Cover the white layer with the pink bath bomb mixture. Once full, set aside that half of the bath bomb mold. Fill the other half of the mold half way with purple bath bomb mixture and pack down. Fill the remainder of the mold with pink bath bomb mixture. Slightly overfill this half with the pink mixture, and squeeze the two halves of the mold together firmly. Very gently, pull one half of the mold away. Slightly twisting while pulling away can make this process smoother. Allow to harden for at least 24 hours. Then package in in cellophane or plastic wrap to protect them against excess moisture and enjoy! Can I use corn starch instead of clay in this recipe ? Can you use something other than shea butter? Hi! Would poly 80 help with the clay or does only work with Mica? I just recently dove into the world of making bath bombs and I’ve really been enjoying myself! I struggled a lot at first but I am slowly getting better….except I have been having a bit of a problem. A lot of my bath bombs have had a problem with cracking, not that they fall apart or anything, they just tend to get little cracks on them. While it doesn’t affect the quality of the bomb itself, it’s just not quite as aesthetically pleasing. I have done everything humanly possible to follow your basic mondo bath bomb recipe to a T (which works great by the way) along with working in low humidity environments just to be extra safe, but those darn cracks always come back to haunt me! 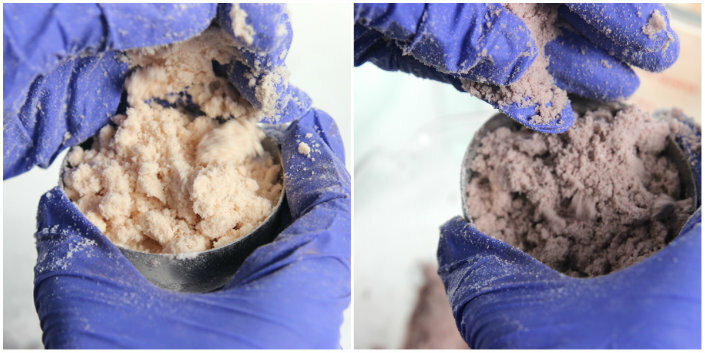 I use citric acid, sodium bicarbonate, and kaolin clay in my bombs and was debating adding grapeseed oil to help hold the structure of the bomb together as well as have antioxidant properties. Do you have any tips or advice to prevent this? I used Australian black clay for a purple color once, but it stained my tub pretty bad. Do all clays stain or leave a ring around the tub? Which witch hazel can you use in the bath bombs? I have the choice between water based, or Glycerine based liquid extracs, herbal powder extract, or witch hazel floral water. Our witch hazel is a combination of Hamamelis Virginiana Distillate and Alcohol, so I would recommend using one mixed with alcohol. 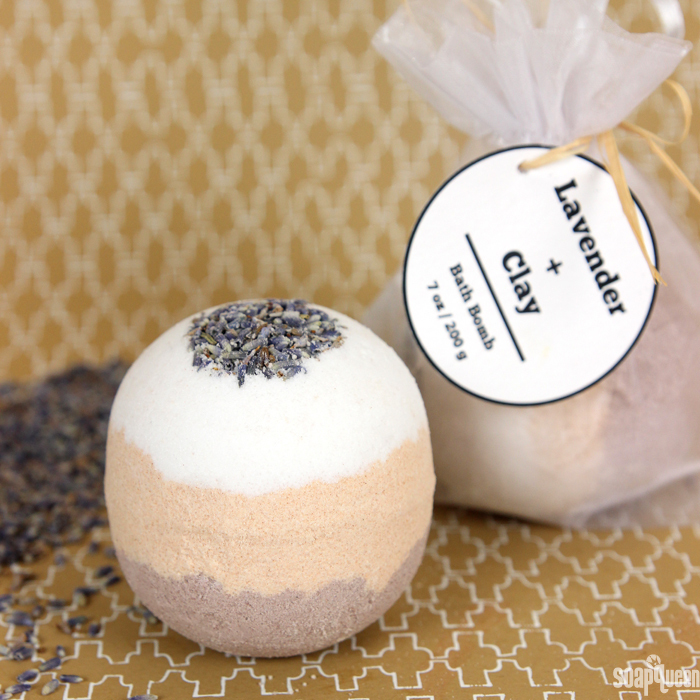 which is better to use – witch hazel or alcohol in bath bombs. Love this recipe, but I’ve been unable to successfully mold them. I’m using all the items in your kit, but after I press the two halves together (after mounding each half up with product and pressing as hard as possible), and then remove one half, the bomb always breaks apart at the join and both halves are still filled with product. I’ve tried gently twisting and not twisting, tapping the mold with a spoon and not tapping the mold, taking the first half off immediately and waiting a few minutes. One of your other recipes that I use without the clay and shea butter unmolds beautifully. Any ideas on how to get this one out of the molds? 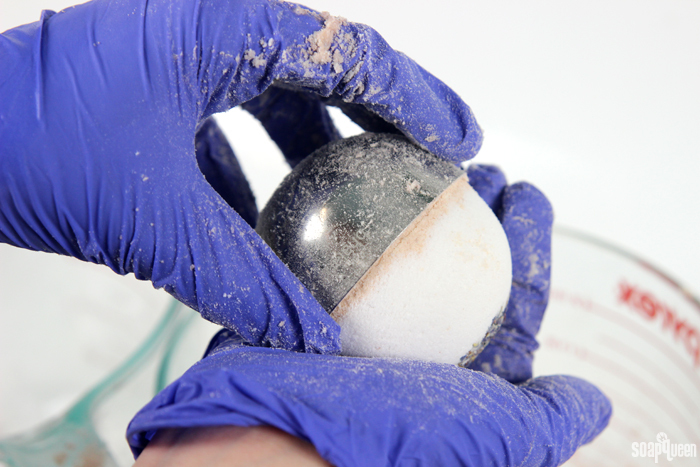 We’ve found the bath bombs have a better chance of sticking together if they are wetter. 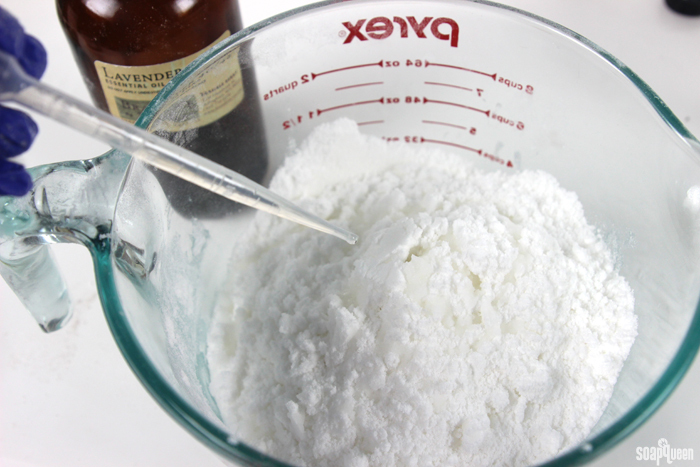 To make this bath bomb mixture a little more wet, you can add more shea butter or spray more witch hazel in your mixture. Thanks! I’ll try the cyclomethicone. Hi, now I have all the ingredients to make this recipe (yeah 🙂 ! ) I have a question about the amount of fragrance used here. It’s so much less than the amount used in the video of the Bath Fizzy Tutorial you refer to, which uses 18ml. 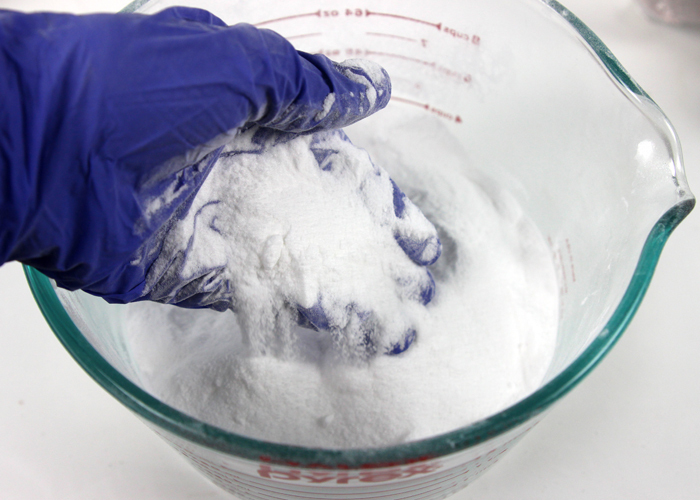 for about 1/3 of the baking soda/citric acid mixture! I know it’s partly a personal preference, but I wonder if the 6ml. in this recipe will give a detectable fragrance in the bath…? That’s awesome, glad you have all the ingredients you need! Thanks, Kelsey! I’m still wondering about the big difference between the two recipes, but will follow your suggestion and start with 12ml. Is there a special reason why this recipe uses stainless steel molds? Is it because of the natural clays -do they react with plastic? Are the labels available to download? I put off making these for a long time because for some reason, I thought they wouldn’t work! I don’t know why I thought that because 99.9% of BB’s recipes have turned out exactly like the picture for me. I thought they wouldn’t stick together or fall apart really easily. Despite my negative thinking these, once again, turned out exactly like the picture! I did need way more than 6 – 10 spritzes of witch hazel. I just kept spritzing and mixing until it was the consistency of moon sand and stuck together. And it made 5 for me, following this recipe exactly. So that’s a bonus! Do you think these will ship well? 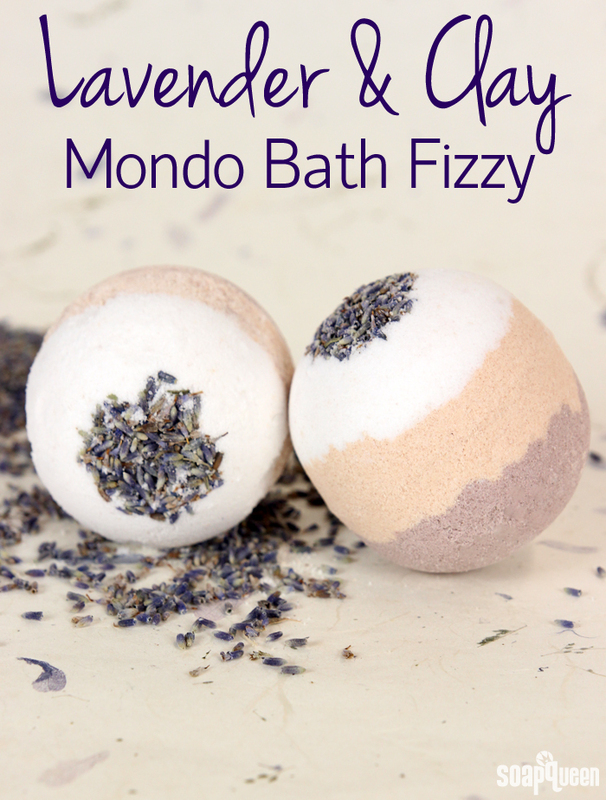 I know BB makes bath bomb shells but do they fit the dimensions of these mondo bath fizzies? Thanks again, BB! Also — update — my toddler said “ball” and hurled these across the room a few afters after making them and they didn’t break. One or two cracked a little but I don’t think the Grandmas will mind. So they are also sturdier than I had anticipated. Also, I’m glad to know they are sturdy enough to withstand toddlers! We do have plastic bath bomb molds, but they are smaller than the stainless steel molds. If you are shipping these, I would recommend wrapping them in plastic wrap and placing them in a box or something to keep them from crushing during shipping. Just tried the lavender clay bath bomb and failed… The first one didn’t come out bad but when I made the rest, they dried out very fast and became hard to work with. I tried using additional witch hazel and that didn’t help. The rest started falling apart. Any suggestions or do I just need more practice? Depending on your climate, the bath bombs can be a bit drier and may need more witch hazel. 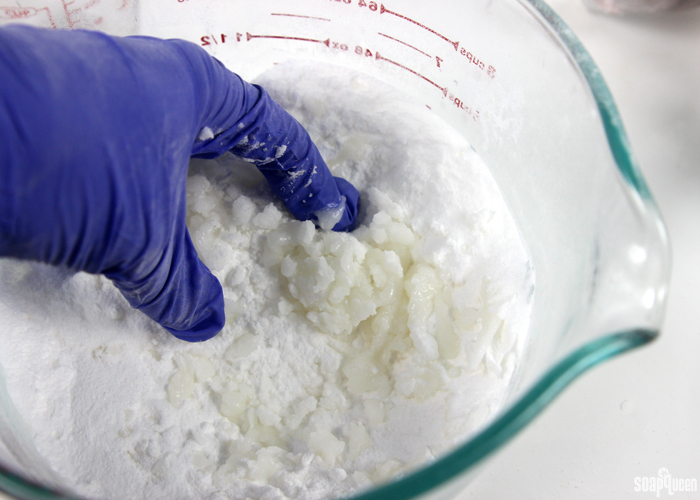 When you’re making the bath bombs, if they clump together in your hand, they are ready to mold! However, if they’re falling apart, spritz them a couple more times and mix again. Repeat that process until the mixture holds together in your hand. To make the mixture intact, if I use shea butter instead of witch Hazel, Won’t the bath bomb becomes more greasy or oily when used? Can I use an alternative to clay as I cannot seem to find powder clay in the UK? Will this make the tub slippery? Thank you. Agreed – I think with the ingredients it should wash off quickly. Looks a lot of fun and love the extracts on the top <3. My SO was trying it out today and I will join her later. We will probably do a video no it!